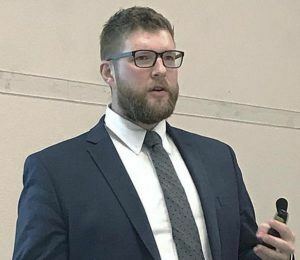 Ryan Kuhns, an economist with Farmer Mac, conducted an analysis of strengths, weaknesses, opportunities and threats for Northwest agriculture during a presentation Jan. 17 at the Northwest Ag Show in Salem. SALEM — With a diverse range of consumer-oriented products and relatively steady net farm income, Ryan Kuhns, an economist for the Federal Agricultural Mortgage Corp., also known as Farmer Mac, sees strength in Northwest agriculture heading into 2019. On the other hand, sticky input costs and lingering trade uncertainty continue to pose threats and weaknesses for farms, making it essential for producers to consider the whole picture when making business decisions about what they grow, and for which markets. Kuhns conducted an analysis of strengths, weaknesses, opportunities and threats for the region during a presentation Jan. 17 at the Northwest Ag Show in Salem, crunching the data to paint an overall picture of the economic landscape in Northwest farm country. The Northwest Ag Show, which returned to Salem Jan. 16-18, featured a full lineup of guest speakers at the Oregon State Fair and Expo Center, discussing everything from estate planning to worker safety. More than 120 vendors were also on hand to showcase their equipment and services. Kuhns, who considers himself an optimist, started his talk with strengths before ending with opportunities. He said the Northwest has a rich portfolio of crops for human consumption, versus the Midwest where farmers grow vast quantities of corn and soybeans for livestock consumption. That diversity lessens the volatility of income, Kuhns said, and encourages more direct-to-consumer sales, a major benefit for beginning farmers and especially those that are small-scale. “I think there’s a real strength to that,” Kuhns said. The estimated value of Northwest farmland also increased between June 2017 and June 2018, by 2.6 percent in Oregon, 5 percent in Washington and 3.8 percent in Idaho, compared to the Upper Midwest where values actually decreased in some states over the same period. Though land and asset values have increased locally, Kuhns said total farm debt increased in 2018 and is nearing peak levels from the 1980s. Working capital is shrinking due to higher input costs versus commodity prices, resulting in tighter margins. Oregon, Washington and Idaho exported nearly $8 billion worth of goods in 2017. Japan is a key trading partner for Northwest wheat and beef, and until the countries can negotiate a trade agreement, Kuhns said the TPP will provide lower tariffs for Australia and New Zealand growers into the Japanese market. The good news, Kuhns said, is that trade with emerging nations opens new opportunities as populations in those countries rapidly continue to grow. Domestically, Kuhns said younger consumers are increasingly interested in buying local food, giving an edge to Northwest farms. The purpose of a S.W.O.T. analysis, Kuhns said, is to get farmers thinking about what opportunities match their strengths, or how they can leverage new opportunities to turn a weakness into a strength. Farmers can also plan and mitigate for new threats that exacerbate an existing weakness.